Please be advised that “K” Line Tokyo Head Office published the following press release today. 1. Changes of Executive Officers. Executive Officer Ako Hiraoka Counselor, “K” LINE LOGISTICS, LTD.
At the British International Freight Association (BIFA) Annual Awards Lunch in London on 19th January, the global freight insurance specialist, TT Club presented the European Logistics Award to European freight forwarder Delamode Group. The Award attracted a wide-range of entries, which the panel of judges praised for their innovation and technical prowess. This year’s winner, Delamode Group is a multi-service global forwarder with strategically located offices throughout Europe. Delamode provides freight forwarding services and supply chain management solutions to a variety of industry verticals, in particular fashion logistics. Mike Yarwood, TT Club’s Senior Loss Prevention Executive, in presenting the Award said, “TT Club is once more delighted to sponsor this Award and appreciates the role BIFA plays in encouraging best practice in the international freight and logistics industry. The judges were particularly impressed by the way Delamode Group had identified a new business opportunity and had successfully developed an innovative solution thus improving services along certain trade lanes. The result is that Delamode Group’s customers benefit from much faster and more cost effective delivery options and the company has an opportunity to use this business model to serve further regions in the future. TT Club is certainly seeing a greater degree of innovation in the services being provided by its customers. Many companies that in the past offered traditional freight forwarding now take on a much higher degree of supply chain risk and become exposed to greater liability by providing increasingly complex and sophisticated services. The trend is, however, seen as positive. The increased complexity of service offerings and the ingenuity of operators in designing alternative supply chain solutions strongly demonstrate the logisticians’ value and provide opportunities for new entrants as much as established logistics companies. The BIFA Freight Services Awards have been running for more than 25 years, and the ceremony has been held at the Brewery in Chiswell Street, London, since their inception in 1989. A carefully selected judging panel, consisting of sponsors and independent industry specialists, ultimately determines the winners. The British International Freight Association (BIFA) represents UK companies engaged in the international movement of freight by all modes of transport. A not-for-profit organisation, BIFA is funded by subscription and run by its members for members. It operates with a full-time Secretariat, which administers and manages the Association’s affairs. BIFA provides an effective and proactive organisation dedicated to improving standards of professionalism within the logistics and supply chain industry. Let Us Join Forces to Realize a Revitalized “K” LINE. To everyone of the “K” LINE Group, I extend to you my sincerest wishes for a Happy New Year. As we enter 2017, I would like to take this opportunity to reflect on the past year and offer looking forward to the challenges ahead. The year 2016 started with concerns that an economic slowdown in emerging nations would spill over to the developed nations. However, as the year progressed, the global economic situation gradually recovered, with temporary instability in the international financial market settling down amid signs that the slowdown was braking. On the other hand, various disruptions emerged against a backdrop of growing political and economic uncertainty, and consequently the recovery never gained much steam. Looking at individual regions, despite apparent weakness in capital investment, the U.S. economy continued to see improvement in its employment situation and income environment. As for the European economy, destabilizing factors that included frequent acts of terrorism and the U.K.’s decision to exit from the European Union in June intensified concerns vis-à-vis the economic outlook. In Brazil and other emerging markets, there were signs of modest economic recovery amid feelings that the fall in resource prices had finally bottomed out. However, in China, the economy continued to slow as a result of concerns about excess capacity among domestic enterprises due to weakening demand. Japanese domestic economy showed improvement in terms of its employment and income environments. However, sluggish consumer spending coupled with a strengthening yen during the year’s first half produced an economic landscape that lacked a feeling of stability. The results of the U.S. presidential election in November went against the predictions of most pundits. Consequently, close attention will be given to how the yen, which showed a weakening trend in the immediate wake of the election, moves in the days ahead, as well as to how U.S. policies take shape after the new administration comes to power. Our medium-term management plan, which is a five-year plan that looks to 2019, when we will celebrate our one-hundredth anniversary, sets out the road we will take in attaining our business targets as well as the roles of organizations and individuals toward this end. It is oriented toward raising our corporate value, which we call “ Value”. However, the unprecedented turbulence that is affecting our main segments—namely Containerships and Dry Bulk Carriers businesses—has been difficult to counteract, despite the sincere efforts of each employee in his or her duties, and is having a serious impact on our business performance. Even the strengths generated from our portfolio management—components of which include our Energy Transportation Business and Car Carrier Business, which are based on our advanced know-how in maritime technologies; Logistics Business, which is resistant to the effects of fluctuations in the shipping market; and Dry Bulk Carrier Business, which is built primarily on medium- and long-term contracts—are not enough to counteract the worsening performance of these two highly volatile segments. Consequently, 2016 was an extremely tough year for our group in terms of business performance. Given this reality, we endeavored to ensure our future cost competitiveness by promoting dry bulk business-centered structural reforms during the course of FYs 2015 and 2016. At the same time, we reexamined our medium-term management plan and revised our performance goals in “ Value for our Next Century – Action for Future -.” It is unfortunate that we had to make downward revisions at the end of the first year of the five-year plan. Nonetheless, we quickly recognized changes in the environment amid the emergence of an unexpectedly severe market, and we were able to seize available opportunities and take the measures needed at the time. There are strengths and weaknesses in each of in our respective segments. However, within an extremely tough three companies, I believe that everyone in the Group has been committed to achieving the goal I put forth in last year’s New Year Message, namely, “to further raise our corporate strength by enhancing individual strengths, and aim to become a globally trusted corporate group.” In no sense can we be optimistic about the coming year. Nevertheless, it will be particularly important for each individual to execute his or her duties by being unwaveringly focused on personal role and organizational goals, with an eye to achieving the company’s goals. Most importantly of all, I want to mention that we made a highly significant decision on October 31 of last year. We decided to spin off our Containerships Business—which, for the three major Japanese shipping companies, has always been a core business—and our Overseas Terminal Business from our main businesses and reestablish them in a new joint venture run by the three companies. In effect, we are executing a plan for structural reform of these businesses that we have operated independently for years. Previously our three companies had decided to start joint ship assignments in our containerships businesses, primarily on the East-West routes (Asia-North America, Asia-Europe, and Europe-North America), as members of a same alliance in April of this year. However, given the current business environment, in which competitors cannot be defeated without significantly higher cost competitiveness, we decided to go one step further by integrating our businesses in the spirit of “three companies operating on equal footing.” We thus decided to change to a new management structure by founding a new company. Our new containerships business strategy for the future will be as follows: To fight equally with overseas competitors that pursue economics of scale by applying cost competitiveness generated from the size of our combined fleets and integrated systems together with the sales competitiveness each of us has developed over the years. It is a strategy that takes a medium- and long-term perspective shared by all three companies. From this integration a business framework capable of generating profits even when market conditions are as bad as they are now will be established. The new joint venture will begin operations in 2018, the year marking the 50th anniversary of delivery of “Golden Gate Bridge” as ”K” LINE’s first full containership. The environment surrounding our fifty-year Containerships Business has changed greatly, particularly in terms of its expanded size. We therefore need a business framework that is adapted to that change. 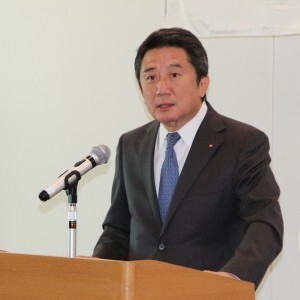 The emergence of such a framework means that the liner trade of Japan, a nation surrounded by the ocean and built upon marine transport, will triumph with a robust organization built on the combined strengths of our three companies. With the exception of the two businesses that will be integrated, our three companies will continue to operate independently as in the past. After the new framework is established, we will be managing a new portfolio, one that combines our participation in the Containerships Business through the new joint venture, as an affiliated company accounted for by the equity-method, with other segments that we will operate directly. This means we will be executing revolutionary changes toward becoming a revitalized “K” LINE. I am confident that we will successfully ride out the stormy seas that lie ahead when each one of us faithfully executes his or her duties with an eye to personal goals, making maximum use of our strengths as a comprehensive shipping line group and with a spirit of fearlessly facing new challenges that is founded on high organizational targets. We will be formulating and announcing a new medium-term business plan to fit with this restructuring of our Containerships Business. Nonetheless, there will be no change whatsoever in our corporate principle and vision, including our initiatives for environment protection. With tireless effort to ensure safe and precise marine transport, and in response to social demand for environmental conservation, let us step forward boldly to tackle front-line challenges. And as we aim for sustainable growth, let us also be sure that the interests of the “K” LINE Group and society are one. In closing, as we celebrate the New Year, I wish all of you, the members of the “K” LINE Group, and your family’s good health and prosperity, and pray that all ships will enjoy safe passage throughout 2017. Following its commitment to corporate social responsibility, the global supply chain operator GEODIS supports the Spanish “Cruising for Children” initiative. “Cruising for Children” helps children and teenagers who are at risk of social exclusion in qualifying for future jobs. 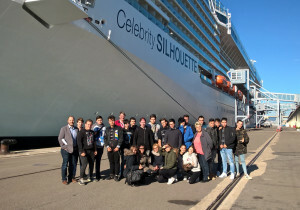 As part of the “Cruising for Children” initiative, the Freight Forwarding Line of Business of GEODIS in Spain brought a group of 30 teenagers to tour the ship Celebrity Silhouette, in the port of Barcelona. The teens are participating in a program called PTT Viladecans (Pla de Transició al Treball). The PTT program represents an educational and professional alternative for teenagers between 16 to 21 years of age who did not complete their high school education. PTT provides basic education to facilitate the development of personal and professional skills required in the working world enabling them to continue their studies or find employment. During the port visit Jordi Millan, Marine Logistics Manager for the Freight Forwarding Line of Business of GEODIS in Spain and Niko Frzop, Air Planning & Product Supervisor for Royal Caribbean Cruise Ltd. Spain & France, explained to the participants the professional activities that take place at a port and onboard a cruise ship. The aim of this visit was to motivate and encourage the participants to continue to pursue and complete their education which will better position them for future employment opportunities. Further supporters of the “Cruising for Children” initiative were the Port Authority in Barcelona (Autoritat Portuària de Barcelona) and the public transport provider Transports Ciutat Comtal. For GEODIS this was the first out of a series of events to further support “Cruising for Children”. “We are enthusiastic about this initiative and keen to organize other joint activities”, commented Niko Frzop.